China’s cooperation in increasing international pressure on North Korea during 2017 served to accelerate declining relations between the two states. Now, with potential peace ostensibly looming, China is seeking to reverse course. A burst of diplomacy has Beijing scrambling to pick up the pieces and reclaim influence it feels it lost, all while Kim fitfully courts Washington. Pyongyang won’t easily play ball with Beijing. Tom Fowdy looks at the Chinese angle.– Christopher Green, Senior Editor. It is an alliance which exists more in symbolism than substance. The Sino-Korean Treaty of Friendship and Cooperation (中朝友好合作互助条约), the long-standing agreement between China and North Korea, today bears little relation to the geo-political realities between the two countries. As a potential peace regime finally seems possible in the region, the sudden increase in high level interactions between both sides of the Chinese-North Korean relationship should not be mistaken as compensation for the long-term deficiencies. China appears to be awakening to the reality that it may lose significant influence over the Kim Jong-un regime at a crucial time. Maximum Pressure on Zhongnanhai | A year ago, a key component of Donald Trump’s “maximum pressure” policy against North Korea was to engage China’s cooperation in sanctions enforcement to bring Kim Jong-un’s regime to the negotiating table. Beijing, Pyongyang’s biggest economic partner, had long been perceived to take a liberal approach to sanctions implementation, fearful of the political ramifications of such. As tensions escalated, the North Korean state media complained, and there was a noticeable shift in Beijing’s public attitude. China’s compliance in the growing number of resolutions was largely robust, with trade between the two countries plummeting dramatically in 2018 due to tough enforcement measures. However, in Spring 2018 as the surprise announcement of a Kim-Trump summit emerged, just days later Kim Jong-un appeared in Beijing to meet the Communist Party leader himself. Beijing has scrambled to pick up the pieces with Pyongyang and secure its own influence, anxious of an arrangement that could compromise its own security. The momentum has been placed in Pyongyang’s court. Long before “maximum pressure” and serious sanctions enforcement begun, China-DPRK relations were already strained. Kim Jong-un sought to carefully wrestle himself away from Beijing’s political influence and make distance with his neighbour, even as economic ties with the PRC expanded. For five years since both took office, Kim and Xi had not met and instead, the latter focused on building ties with the South Korean leadership. The execution of Kim’s uncle, Jang sung-taek, a figure with close ties to China, was largely perceived as an anti-China move. Increasing nuclear and missile testing, significantly the crisis of 2013, also accelerated the further deterioration of official ties. Despite the growing high-level coldness, China’s approach nevertheless remained cautious to its neighbour whilst mutual economic ties on the grassroots continued to grow between the two countries. For all China consistently found North Korea’s path unacceptable, the fundamental goals of maintaining the survival of the regime and concurrently, regional stability led to an indifference than serious action. Zhongnanhai ultimately opted for moderating dialogue above coercion as the answer. Thus, from 2013 to 2015, economic ties and trade between the two countries continued to grow. However, in 2017, the initiation of the Trump administration changed China’s calculus. As Trump vowed to denuclearize Pyongyang, be it by force if necessary, Beijing feared a potential conflict on the Korean peninsula, as well as broader moves by the administration placing unilateral measures on Chinese institutions; the Bank of Dandong having been designated by the U.S treasury in 2017. Trump’s bellicose rhetoric, combined with his individual level charm offensive towards Xi, ultimately steered China’s interests towards tougher compliance. Although it wanted neither, the consequences of military action may have proven worse than regime collapse. Xi decided to stringently cooperate, initiating a series of high profile stunts to signal this shift, including rejecting coal shipments from the North early in the year, then as things worsened, publicly banning the sale of petroleum products by September. In the face of American criticism, China’s diplomatic rhetoric outwardly expressed enthusiasm for United Nations sanctions measures, even if inwardly it sought to water them down. Eventually, China’s cooperation in the process would later be praised by Trump. Despite having sincerely cooperated with UN measures, China’s compliance has come with a diplomatic cost, that is potentially losing influence in any peace and denuclearisation arrangement. Combined with Kim’s attempts to shun China, the overwhelming dominance of Trump in “maximum pressure” served only to shift diplomatic momentum away from Beijing and set the narratives around an exclusive “Pyongyang-Washington” issue, something which Kim Jong-un ultimately wanted to achieve. Despite its cooperation in sanctions implementation, Beijing found itself increasingly distant from the wider diplomatic picture surrounding the DPRK. Although it aligned with Russia in presenting a “freeze for freeze” proposal to de-escalate the crisis, the proposal was dismissed, not just by Washington, but Pyongyang too. The Cost of Cooperation | With the diplomatic process now underway and the upcoming Kim-Trump summit looming on the horizon, the shift in diplomatic gravity has led Beijing to fear it is irrelevant to the changing context. Pyongyang seeks to take full advantage of this. Having always desired North Korea as a stable “buffer” periphery, the Chinese Communist Party fears, as unlikely as it may be, that North Korea could strike a deal with Washington that allows Pyongyang to hedge against China and cooperate with the U.S security umbrella in Asia, a move detrimental to Beijing’s national security and regional ambitions. China has accordingly responded by initiating a surge in fast diplomacy between the two countries. 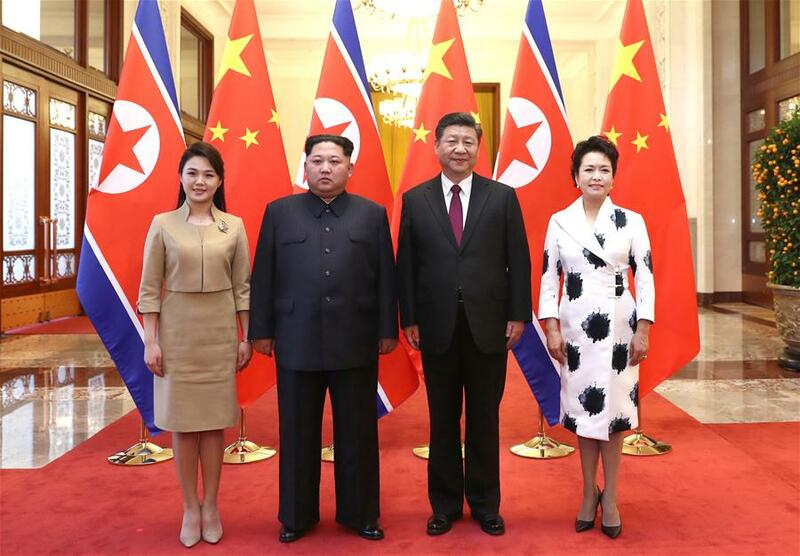 This includes Kim Jong-un’s surprise visit to Beijing, the state liason department delegation’s visit to Pyongyang, the visit of Wang Yi and Kim’s second meeting with Xi in Dalian. Throughout this process, China likely sought to reassert its own interests and influence in the matter, prompting Pyongyang to ensure that the U.S military presence in South Korea will ultimately be reduced as part of any deal, something which Pyongyang had notably left out of its demands. North Korea, however, will not accede to Xi’s requests for nothing. It will inevitably demand sanctions concessions and other incentives to acquiesce to China’s requests. Although it is far too early to draw broad inferences, there are some telling signs already as cross-border trade has begun to pick up again between the two countries, as well as the reported return of DPRK workers to China and the resumption of oil-product sales (North Korean fuel prices also dropped suddenly and sharply throughout April). It is also noteworthy that despite North Korea’s ongoing rhetoric concerning the “Ningbo 12” workers who defected in 2016, it has been careful not to make China a part of this propaganda, underlying their economic importance. Further analysis ought to be focused on how the resetting of ties between the two countries over the coming months influences the economic relationship. The sale of commodities such as coal will certainly be an area to watch, however, as the Lowy Institute observes it can be easy to oversimplify given events, such as China’s rejection of coal imports in 2017, as signals of geopolitical content/discontent, at the expense of how issues on the ground such as poor infrastructure, low profits and dissatisfaction amongst Chinese businesses may impact decision making. Whilst reclaiming and maintaining economic influence over North Korea will remain a crucial goal for Beijing as the peace process takes shape, the parameters of what form it will take are constantly in flux. Ultimately, Beijing prefers economic ties to be a bilateral process of give and take, than a convenient one-way profit margin for Pyongyang. The Fear of Being Ignored: Conclusion | Beijing ultimately fears it may be the biggest loser from the North Korean crisis. In the bigger picture, the long deterioration of ties between Beijing and Pyongyang was beneficial to Kim Jong-un as he sought to attain equal footing with Washington in negotiations, something he has now achieved. Beijing’s cooperation in “maximum pressure” was sincere, but it was ultimately too little and too late as it failed to act firmly on years’ worth of previous provocations. Now, it has to do all it can to avoid an unfavourable outcome for itself and is, consequentially, scrambling to rebuild relations with its neighbour, which cannot come without a price. In this sense, whilst Kim tactfully has avoided becoming a part of China’s periphery and is forcing their hand accordingly, it may yet be a foreign policy victory for the Trump administration in partially wooing a state away from China’s influence.